In case you haven’t noticed – over the years here at CMI we’ve spent quite a few brain cells and digital ink defining and defending the approach of content marketing as a separate and distinct methodology to influence customer behavior. That post still reflects on CMI’s definitions page – which still serves to this day as the No. 1 Google result to the question “what is content marketing.” But, of course, our practice evolved. As we looked a few years later, I wrote an article that attempted to stratify the approaches of content strategy and content marketing. And then, more recently, as approaches such as branded content, brand journalism, native advertising, and brand experience (yeah it’s a thing) grew in popularity, we wrote an article and created an accompanying video that tried to separate signal from noise on the different approaches of content in the business. In short – we’ve ranted (both rightly and probably at times too stridently) about what content marketing is and isn’t. Mostly (I hope) our aim has not been to take shots at other approaches, but rather to defend content marketing when people came along to invalidate or co-opt the practice. One thing I know for sure is that over the last 10 years we’ve always tried to have clear eyes and a full heart about why we think the separations are important. Well – we’re in 2019 and we’re about to run up on more than a decade’s worth of experience. Let’s take a breath and see where we really are. Because, as usual, we have watched you – the practitioners in the businesses – accomplish the true innovation. 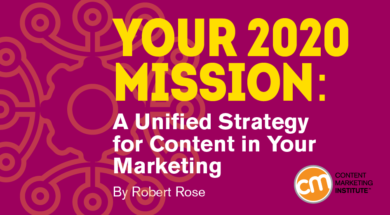 We’ve been watching as you content leaders, strategists, managers, writers, SEO specialists, and technologists have found the optimal ways to make content in marketing and communications a scalable, measured, and exciting approach. Quite honestly, we’re humbled at the level of innovation we’ve witnessed. And it’s time for us to evolve too. It’s high time to unify and examine #AllTheThings. Yes, to be clear, the differences in the approaches still matter – probably more than ever (and we will continue to highlight them). But it’s time to acknowledge that it’s the same people that make all manner of content a success. Yes, we still believe that companies should operate like media companies. But today, content teams are not only deploying owned media platforms that build audiences – they simultaneously are tasked with being the experts at native content, branded content, and technological, process-driven content strategies that enable these strategies to be governed, managed, and optimized effectively. If I can brag for a moment, I would say that we have a good, 50-yard-line view of where content sits in business these days. As I noted in my last post, in 2018 my team – the consulting and education group – worked directly with more than 30 of the Fortune 500. CMI’s amazing research team conducted our annual Content Marketing research, which generated responses from 1,947 marketers across the world. Content Marketing World 2018 saw more than 3,700 marketers from more than 50 countries gather to talk about the strategic approach of content. When we pull together the insights from all those inputs, we can see some conclusive trends. 1. Focused, centralized content teams are being assembled. Successful businesses are taking the function of enterprise content seriously. They are moving beyond the one or two ad hoc practitioners supporting the whole business – to specialized teams focused on strategic content in marketing and communications. Sixty-seven percent of B2B organizations are fully committed to the practice of content marketing, and half these organizations expect budgets to increase over the next year. In B2C, it’s a similar story. Fifty-seven percent are looking at increased budgets, and 64% say their organization is fully committed. 2. Scalable, operational models for these teams remain elusive. This is where the differences between the approaches of branded, native, content marketing, and content strategy really rear their head. Put simply, today’s content teams are simultaneously tasked to support marketing and sales objectives, as well as create content that supports audience building and more integrated business objectives. But what’s the model for that? Too often, nascent content teams are assembled with no separation of approach. Content teams are measured simply by how many content assets they can create and serve as digital targets for promoted marketing campaigns. An amazing, audience-centric piece of content might suffer from a horrible marketing campaign. Or, conversely, a mediocre piece of content might shine based on a well-executed marketing campaign. In our experience of helping hundreds of businesses with operational models, this approach is simply a misalignment of priorities vs. goals. As we wrote recently, as teams are assembled, they must look to create a “business model of content” that truly understands what this media model looks like – and how it can be measured appropriately. 3. Goals and measurability remain a challenge. If there is one through line to the struggle of content to gain traction in the business – as well as the confusion over the usage of branded content, native advertising, or content marketing – it is how to support goals and measure progress toward them. These days it is extraordinarily common for the team handling the creation of content for owned media and audience-building purposes to also create content for a native advertising campaign or to be part of a branded content effort. Now, assigning appropriate and measurable goals for the different types of efforts is extremely important – and we have started to see some true frameworks emerge. However, the operational model may be even more important – because companies that have clarified and created a foundational documented content creation strategy are succeeding in greater numbers. The content creation process for businesses must be one where the content you are creating must work harder, must be reusable, and must be scalable across multiple approaches. The idea for a thought leadership piece must work on your owned media platform, as a syndicated white paper, a webinar, a native piece on an industry journal, and as a series of social media-fueled infographics. Thus, you not only need a centralized method of creating all the appropriate assets to measure correctly. You must have a common – and clear – way of measuring those efforts to see what is really working where. Goals and measurability have much more to do with having an appropriate and scalable operational, governance, workflow, and technology practice than whether you have engaged the right agency or creative freelancer. There may be no more perfect example of this evolution than what we’re seeing evolve at Red Hat, the $3 billion software company. Over the last few years Laura Hamlyn, its global director of content, has evolved the content team from a handful of people creating content assets for sales, the C-Suite, and SEO-focused articles for the website into an integrated center of excellence, leading content as a differentiating brand, marketing, and sales effort. What does this mean for CMI? Our goal remains the same as it has since Joe wrote his seminal blog post: to advance the practice of content marketing. But if this mission is our North Star, then we must acknowledge and expand our horizons to meet the changes of an evolving space race. Is a leader in the organization’s communication strategy. The team does not serve as an internal, on-demand content vending machine – but as part of the fabric of marketing and communications for the business. Understands the differences and intricacies of all operational approaches of content in the business, from content marketing and content strategy, to branded content, to native advertising, or anything else that inherently drives media creation as a business strategy. Aligns the measurement and goals appropriately to the strategy being executed. The content team members of tomorrow will build audiences through owned media experiences that can be monetized in multiple ways. They drive promotional execution of content for short-term advertising campaigns. They drive shares and organic search traffic from smart earned media and word-of-mouth strategies. Supports every part of the customer’s journey. The content teams of tomorrow are not just top-of-the-funnel, sales enablement teams. They are not just SEO-focused teams driving brand awareness. They are not just customer-support organizations, managing how-to videos, or customer events. Tomorrow’s content teams are the experts in delivering audience value at every stage of the customer’s journey. And thus, we expand our mission, our editorial coverage, our teaching, and our learning as well. At Content Marketing Institute, you will see more coverage on topics such as native advertising, branded content, and content strategy as well as our continued focus on the approach of content marketing. It’s a unified family of specific, yet related approaches to the strategic use of media in our business. CMI is here to support you – the content marketing team leaders, the practitioners, and every single subject-matter expert. Technology often is one component in unifying content in marketing strategy. Make plans today to attend ContentTECH in San Diego this April. Register using code BLOG100 to save $100.